Mexican chicken with roasted tomato salsa upscales Mexican into dinner party territory. Two simple ingredients come together with a bit of classic technique to make this something that is more than the sum of the parts. Just reading the ingredients doesn’t give you the picture. This is not chicken with tomato sauce. Not even close. It’s big Mexican flavours. But deep, earthy tastes. A wonderfully unexpected result. Roasted tomato salsa is made from almost exactly the same ingredient list as pico de gallo. But the result is completely different. Dark and sumptuous. Complex. Super savoury. Not at all like the bright, vibrant pico flavours. Isn’t cooking amazing? Roasted tomato salsa recipes are all over the internet. I think I counted about 7 million. The world does not need another version. This is not another roasted tomato salsa recipe. I did it only to show you how you can use it to make something special. Classic technique is what brings this all together. Makes it more than just chicken with salsa. The secret is deglazing the pan with the salsa. Pouring the salsa into the pan and scraping up all the goodness in the bottom. It’s also about cooking the salsa in a bit of chicken fat. Something about that step is pure magic. When you deglaze your roasting pan with it, it picks up the flavours of the chicken. It suddenly goes from salsa to sauce. Really, really good sauce. This may not be intuitive but it works. And it works well. Try Mexican chicken with roasted tomato salsa served on a smear of puree of jalapeño flavoured pinto beans.Or black beans with cumin and lime. Surrounded by a generous drizzle of sauce. Garnished with a bit of cilantro. Or a bit of pico or prickly pear salsa. Like I said – dinner party territory. 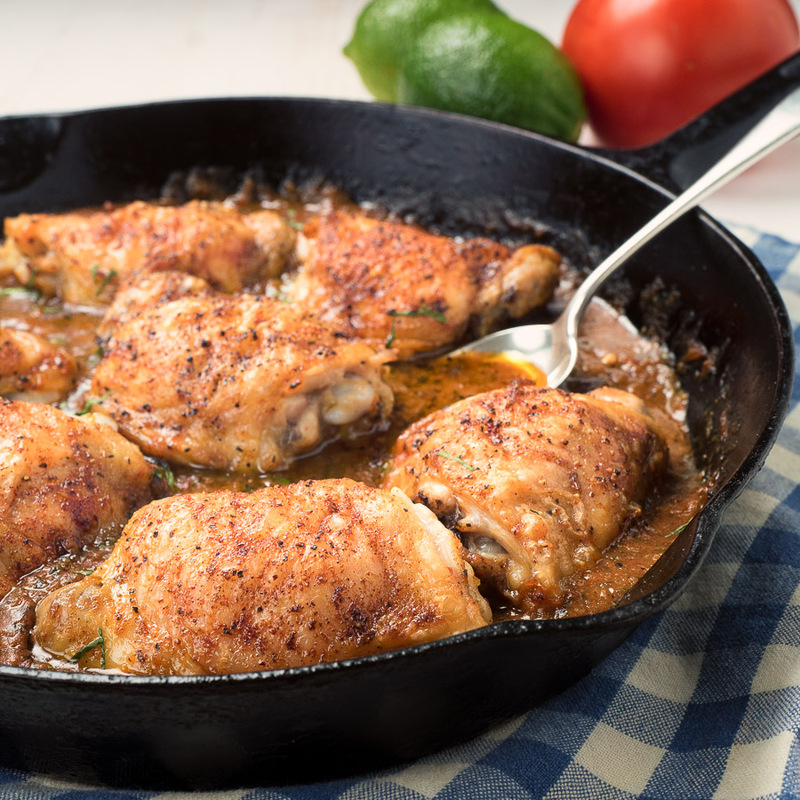 Mexican chicken with roasted tomato salsa turns everyday ingredients into an upscale dinner. Place the tomatoes, onions, jalapeño and garlic on a cookie sheet. Drizzle the onions with a bit of vegetable oil. Broil the vegetables until the garlic skins are coloured and the garlic softens. Remove the garlic and continue broiling the tomatoes start to blacken. Turn your jalapeños regularly and watch the onions. I can't tell you how long this takes. I don't know how mean your broiler is. Combine the roasted vegetables with the cilantro in a food processor and whiz until you get a smooth salsa texture. Add lime and salt to taste. Combine all the spice mix ingredients and mix. Pre-heat a cast iron or similar frying pan large enough to hold the chicken in a single layer. Rub a bit of oil on the chicken and season with the spice mix. Roast the chicken until done. For breasts you want an internal temperature of 165F. For thighs go to 175F. Remove the pan from the oven, remove the chicken and spoon off the visible fat. Be careful to leave all those brown bits and any liquid in the pan. Place the pan over medium heat. Place a towel or something on the handle because you will grab it and burn your hand badly if you don't. Add about 1 1/2 - 2 cups salsa to the hot pan, stirring up all those brown bits. These are the flavour bombs. Cook for about 1 minute. Add enough chicken stock to get to a saucy consistency and bring to a simmer. 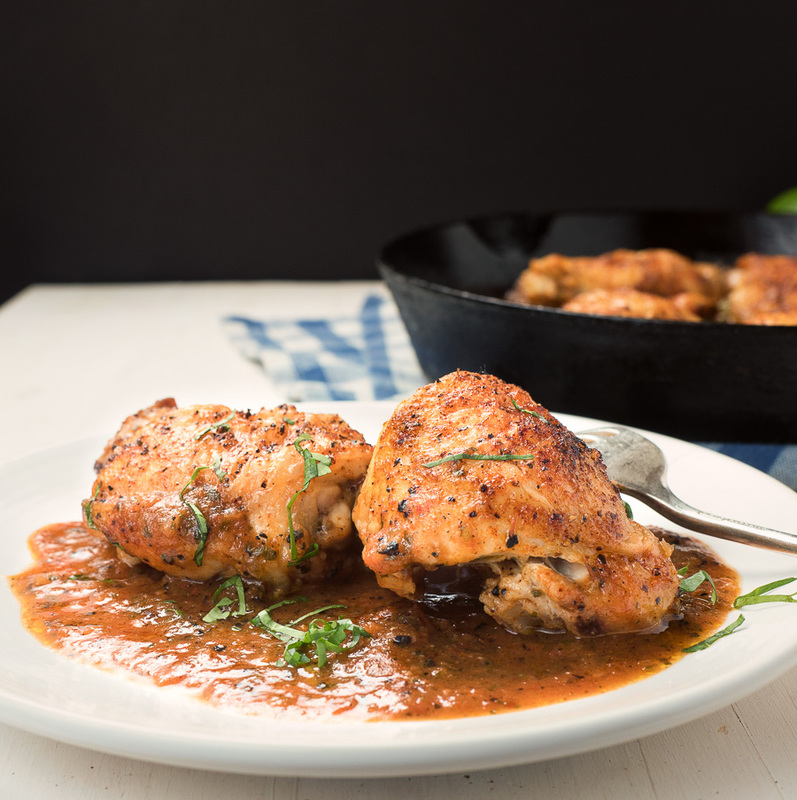 To serve, spoon the sauce onto a plate and top with the roasted chicken. The roasted salsa on it's own is a great alternative to every day pico. More of an earthy taste. To use it like salsa thin it with a bit of water. The spice rub can be used in any Mexican dish. In american, main course, mexican, poultry. Bookmark the permalink. Autumn has kicked in so I have oodles and oodles of tomatoes! Guess what I’m going to do? 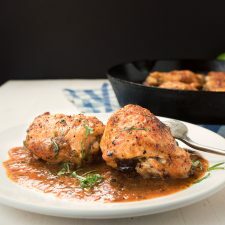 Switch up my chicken of course and make this fantastic one! 🙂 Your flavours never fail. Garden fresh tomatoes. You will be happy with this dish! This is the fourth recipe of yours I’ve tried. All have been so full of flavor; nothing bland. The salsa was delicious and the chicken very moist in this recipe. Your curry recipes are wonderful and better than any restaurant’s. I grew up on the Texas/New Mexico border and your Mexican recipes are very authentic to that region. Your blog has become one of my favorites! Great to hear from you Susan. I’m so glad you like the blog and are finding recipes you want to try. I don’t get to Mexico too often but I do get to Texas and love food there. In fact I often bring Mexican ingredients home with me when I visit because it’s not so easy to find them up North. I love a good pan roasted chicken thigh. The flavors in this dish sound delicious!